NASA’s LADEE (Lunar Atmosphere and Dust Environment Explorer) sets out to perform a short duration science mission with a small cost-effective spacecraft. The mission is divided into five phases: pre-launch; launch & early mission; commissioning; science operations; and extended mission/end of life. In total, the mission will be at least five months in duration. The Pre-Launch Mission Phase begins with the installation of the LADEE Spacecraft atop its Minotaur launcher and spans several days leading up to the launch countdown. In the final days before launch, LADEE and Minotaur complete integrated testing, making sure that all systems function as expected. Also, the integrated stack completes a number of countdown and flight rehearsals to verify the flight software and allow launch team members to exercise procedures. 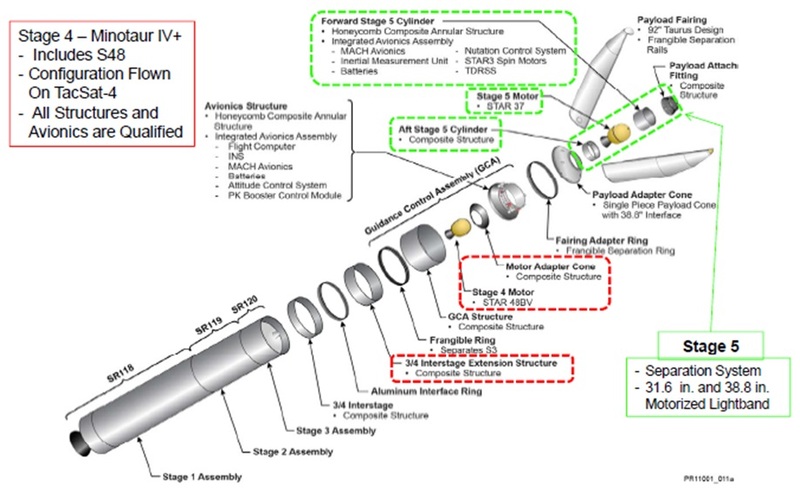 Additionally, LADEE is going through final pre-launch reconfigurations such as battery charging. Minotaur stands 24.5 meters tall, is 2.34 meters in diameter and weighs 89,000 Kilograms on liftoff. It has five stages – its lower three stages are those of the Peacekeeper Missile using solid propellants and the fourth and fifth stage, called Star 48 and Star 37, are manufactured by ATK and have extensive flight history. The Launch Phase begins at L-5 Hours with the initiation of the Minotaur Countdown Sequence that prepares the launch vehicle for liftoff. A Minotaur V countdown timeline can be found here. 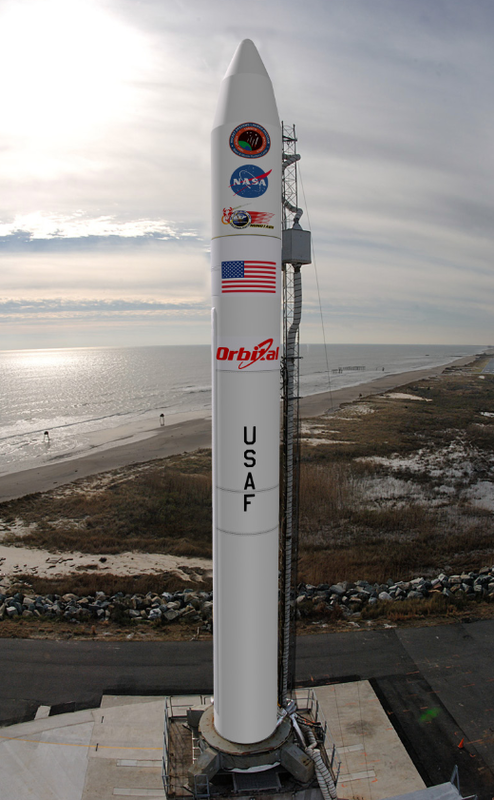 The Launch of LADEE can only take place during five to seven-day long launch slots with about three such slots per month. The launch windows on these particular days vary in time due to the positioning of the launch site relative to the Moon. Currently launch is planned for September 7, 2013 at 3:27 UTC – the opening of a four-minute window. The next day’s window would be 15 minutes in duration. See this chart for all LADEE launch opportunities. At the moment of T-0, the SR-118 first stage of the Minotaur V ignites and LADEE begins its fast ride into orbit as Minotaur blasts off with a thrust-to-weight ratio in excess of 2.5 – causing the vehicle to jump off its pad and shoot skyward. SR-118 provides 227,000 Kilograms of thrust over the course of its 57-second burn. At the moment of burnout, 23 Kilometers in altitude, the stage separates and the SR-119 second stage cuts in with a thrust of 125,000 Kilograms burning until T+1:56 followed by 3rd stage ignition 19 seconds later at an altitude of 99 Kilometers. The SR-120 third stage provides 29,500 Kilograms of thrust over the course of a 72-second burn. While the third stage is burning, the protective payload fairing its jettisoned at T+2 minutes and 43 seconds when the vehicle is at an altitude of 124 Kilometers and aerodynamic forces can no longer damage the LADEE spacecraft. At T+3:28, the third stage burns out and the vehicle enters a coast phase traveling 6 kilometers per second. During the coast, the launcher hangs onto the third stage which is jettisoned at T+7:11 when the vehicle passes 259 Kilometers in altitude. The first three stages of the Minotaur fly a pre-programmed attitude profile to deliver the vehicle to its preliminary trajectory. 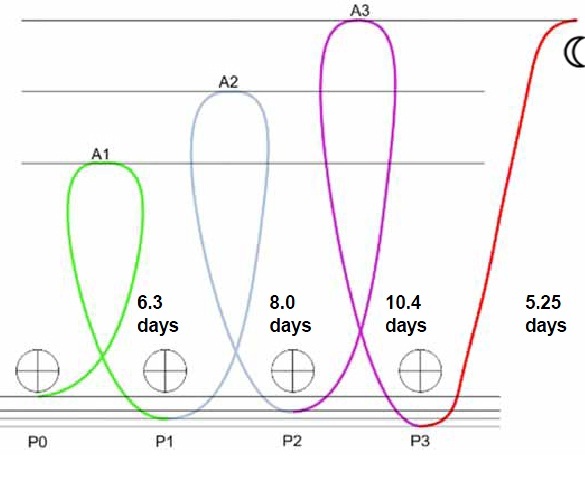 The 4th and 5th stage can modify its flight profile based on the achieved trajectory of the first three stages to optimize injection parameters. At T+7:22, the Star 48BV fourth stage ignites on its 84-second burn delivering 7,900 Kilograms of thrust. Following Star-48 burnout at T+8:47, the stack again enters a coast phase. Around the time of Star 48 separation at T+14:27, the vehicle reaches perigee before igniting the Star 37FM upper stage. Prior to ignition on the upper stage, Star 3 spin motors ignite to spin the vehicle up to 60RPM for stabilization. The upper stage ignites at T+16:57 and burn for 63 seconds, injecting the vehicle into its planned Lunar Transfer Orbit. After burnout, a Yo-Yo system reduces the spin of the vehicle for spacecraft release. Spacecraft Separation takes place at T+23:27 at an altitude of 616 Kilometers. Following separation from its launcher, LADEE begins an initial sequence that is loaded into the flight computer. Because LADEE uses body mounted solar panels, there are no deployment events following insertion. LADEE begins its journey in an initial Safe Mode that it acquires at the point of spacecraft separation. Spacecraft Separation is observed by NASA’s Tracking and Data Relay Satellite System, but initial LADEE communications acquisition takes place via the Hartebeesthoek ground station, South Africa. When initial comm acquisition is complete and the first vehicle health check returns positive results, LADEE can transition from safe mode to three-axis attitude control mode and initiate nominal flight operations to start its mission. The Minotaur V launcher inserts the LADEE Spacecraft into a Lunar Transfer Orbit which in actuality is a highly elliptical Earth Orbit with an apogee of about 50 Earth radii. Orbiting Earth at 384,000 Kilometers, the Moon is about 60 Earth radii away. 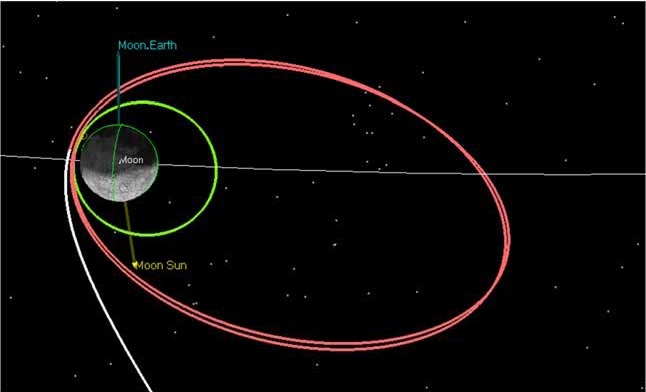 To insert itself into Lunar Orbit, LADEE follows a phasing-approach that allows it to reach the Moon with less propellant than a direct approach. Also, this mission design provides flexibility in terms of launch windows and opportunities as opposed to a direct trans-lunar trajectory. 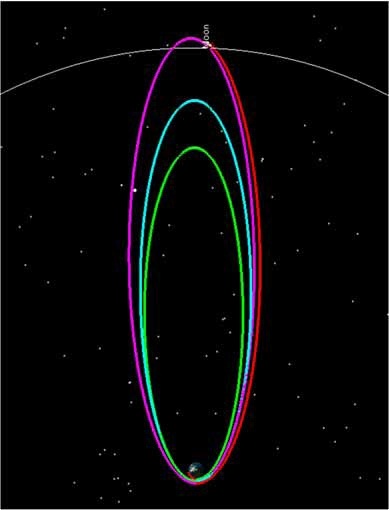 LADEE makes a total of three phasing loops or three orbits of Earth in this elliptical trajectory. 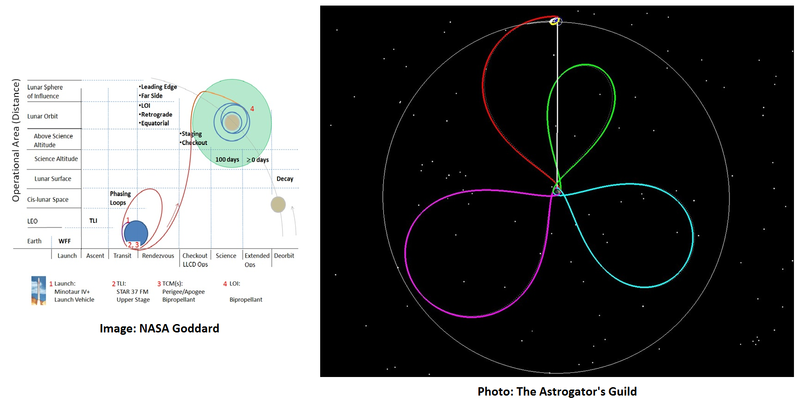 The three phasing loops feature apogee and perigee passages just like any other regular orbit around Earth. When passing perigee for the first time (P1) after taking 6.4 days to complete the first loop, LADEE fires its main engine to perform a posigrade burn to increase its velocity and raise the apogee (A2). Propulsive maneuvers during cruise follow a basic pattern of LADEE stopping its slow cruise rotation, slewing from the cruise to the burn attitude, firing its main engine, slewing back to cruise orientation and resuming the rotation. Three axis control is enabled during the maneuvers. The 2nd loop has a period of 7.6 days and sets LADEE up for TM2, Trajectory Maneuver 2 occurring at perigee P2 to raise the apogee A3 of the 3rd loop to slightly more than lunar altitude. After taking 10.4 days to complete the final phasing loop, LADEE approaches perigee for the final time (P3) and performs a small trajectory correction maneuver – allowing the Moon’s gravity to pull the vehicle in. A large TM at P3 is not needed as LADEE automatically enters its hyperbolic trans-lunar trajectory. 36 hours after passing P3, LADEE completes another small Correction Maneuver to set up for Lunar Orbit Insertion at the pre-planned position. This trans-lunar journey takes about 5.25 days. 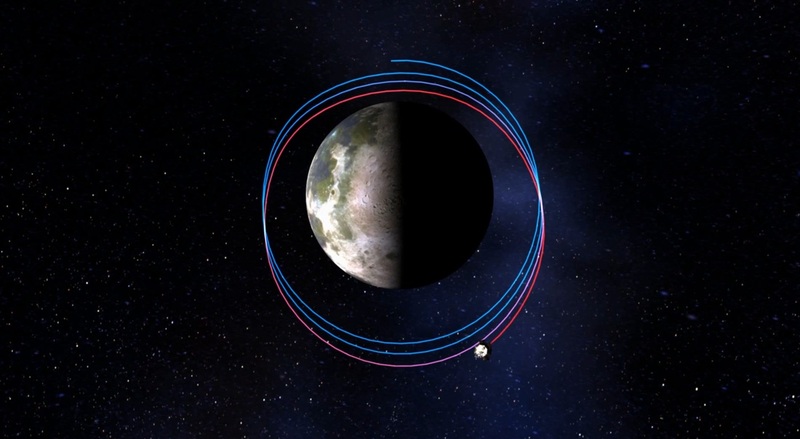 Depending on the actual launch time and insertion trajectory, the exact duration of the phasing loops may vary so that the trans-lunar cruise can vary as well. During the cruise, LADEE begins initial commissioning operations. Because of contamination concerns, the instrument covers remain closed throughout the cruise, but instrument aliveness and electrical checkouts can still be performed. The cruise is also dedicated to vehicle outgassing which is another concern when it comes to opening the instrument covers. The Lunar Laser Communications Demonstration is active during the cruise as the spacecraft generates more power allowing the Lasercom Terminal to run longer. The close proximity to Earth ensures a strong signal for initial tests of the system and calibration operations on the Ground-based Lasercom Terminal at White Sands, New Mexico. 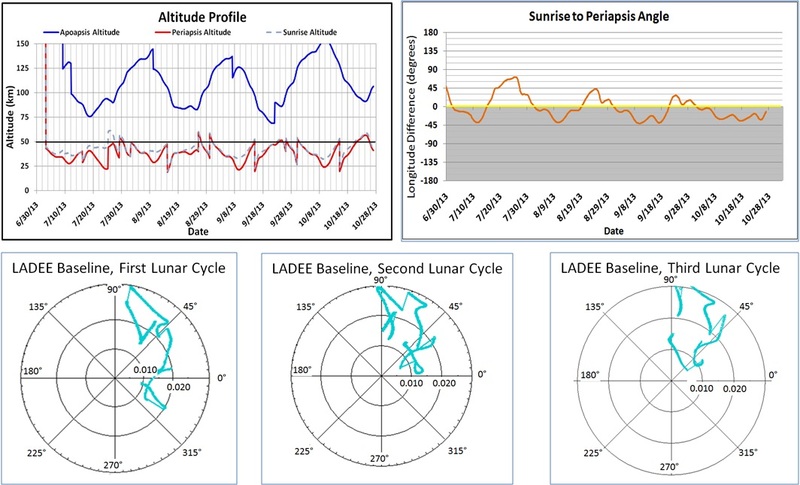 Following the rendezvous with the Moon’s gravitational field, LADEE is on a hyperbolic trajectory. Once arriving at the Moon, the spacecraft disappears behind it on its way to minimum altitude, called periselene. LADEE will use a total of three Lunar Orbit Insertion Burns to enter its Commissioning Orbit. The first LOI Burn is set for October 6 at 10:57:00 UTC and is a critical maneuver. During the burn, the communications direction with Earth is close to the velocity vector and with that to the exhaust plume which may cause limited communications. This first LOI burn is considered a mission critical time-dependent event. The LOI-1 burn places LADEE in a highly elliptical orbit around the Moon. Circularizing the orbit requires to additional maneuvers called LOI-2 and LOI-3. This design reduces overall fuel consumption and also reduces the workload on the main engine and thruster system. On October 7 at 22:51:32 UTC, LADEE is planned to perform a correction maneuver to adjust its orbit in case of LOI-1 insertion errors. After three orbits of the moon in that orbit, gravitational perturbations will have lowered the periselene to about 250 Kilometers which is accounted for in LADEE’s mission design. On October 9 at 10:37:55 UTC, the LOI-2 burn comes up to significantly lower the aposelene and put LADEE in a 4-hour orbit around the Moon. LOI-2 has a planned delta-v of 295.99 meters per second. Once in that orbit, LADEE will again wait three days before making its next maneuver. LADEE targets a 250-Kilometer circular equatorial orbit. Finding the proper LADEE mission and orbit design was not easy due to the requirements of its instruments. For its instruments to obtain the most valuable data, LADEE requires a particularly low orbit. A 50-Kilometer circular orbit was being considered, but due to the Moon’s uneven gravitational field (which you can read all about in our GRAIL section), maintaining a low orbit is challenging and requires a high delta-v budget of at least 400m/s to meet the goal of a 100-day science mission. Because LADEE’s spacecraft mass was limited due to launch vehicle capability, a different mission design had to be drafted to facilitate a delta-v budget of about 180m/s. LADEE is targeting a retrograde equatorial orbit with an inclination of 157 degrees. Science requirements dictate that the terminator crossing (border between day and night) occurs near perigee at an altitude of less than 50 Kilometers. This is required for sun occultation observations to detect atmospheric dust. Brief interruptions of the <50km requirement are tolerable during maneuver phases. With periselene this low, the mission is running risk of crashing into the Moon should an orbit maintenance maneuver be aborted due to a technical problem which brings forward the next requirement. LADEE’s orbit has to be designed in a way that allows at least 4 days of troubleshooting and problem solving before orbital decay occurs which puts a lower limit of about 25 Kilometers to the periselene altitude. The aposelene (high point) of the orbit will be drifting as LADEE controls the periselene but shall not exceed 150km for science data acquisition reasons. Also, the amount of maneuvers has to be reduced to a minimum as burns require spacecraft resources and attitude changes which causes a loss of science time. 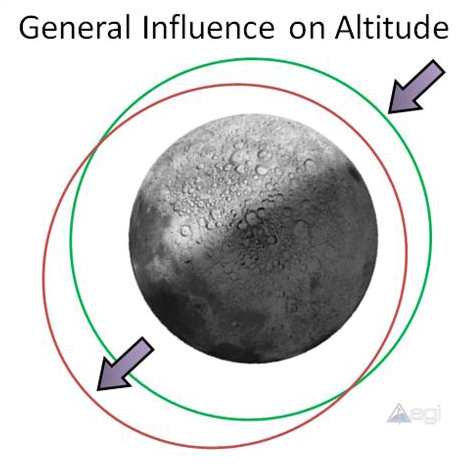 Over the course of its mission, LADEE suffers phenomena that are typical for low-inclination lunar orbits including perturbations in orbital shape – in eccentricity, but not semi-major axis which can be described as a rather unsteady drift of the entire orbit as the periselene altitude drops and the aposelene altitude increases. This is caused by passages over mass concentrations which are abundant across the Moon, but other phenomena can cause other effects on the orbits. Orbiting the Moon in a near circular orbit will cause a constant decircularization which requires circularization burns. LADEE’s operational science orbit is 25 to 50 Kilometers on periselene and 60 to 80 Kilometers on aposelene with periselene occurring near the terminator. Every few days, the vehicle performs orbit maintenance maneuvers to adjust the periselene altitude and re-target the terminator crossing to ensure good positioning for science data acquisition. Toward the end of its operational mission, LADEE is allowed to drop into a lower orbit to capture the most valuable data – studying exosphere properties at low altitude levels. To capture the most-precious data, LADEE collects and transmits science data until the last possible moment before impact at the end of its mission. 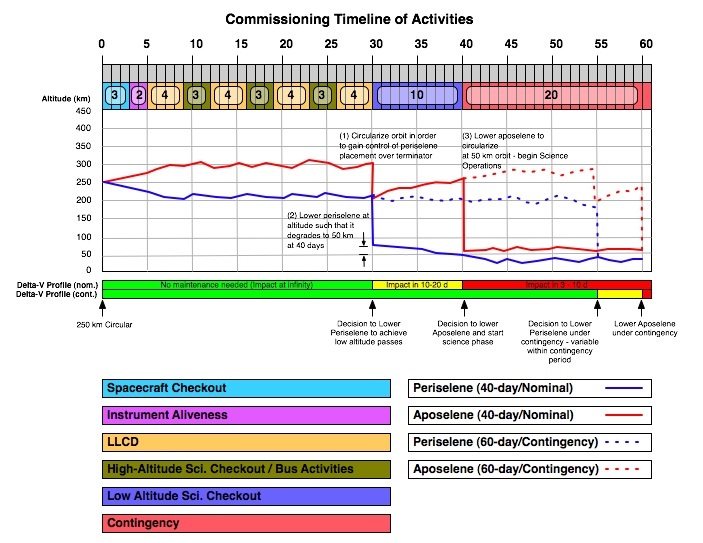 Following its insertion into Lunar Orbit, LADEE starts 40 days of commissioning with 20 days reserved for contingencies. The first three days of commissioning are dedicated to spacecraft checkouts in lunar orbit followed by two days of instrument aliveness and electrical testing. 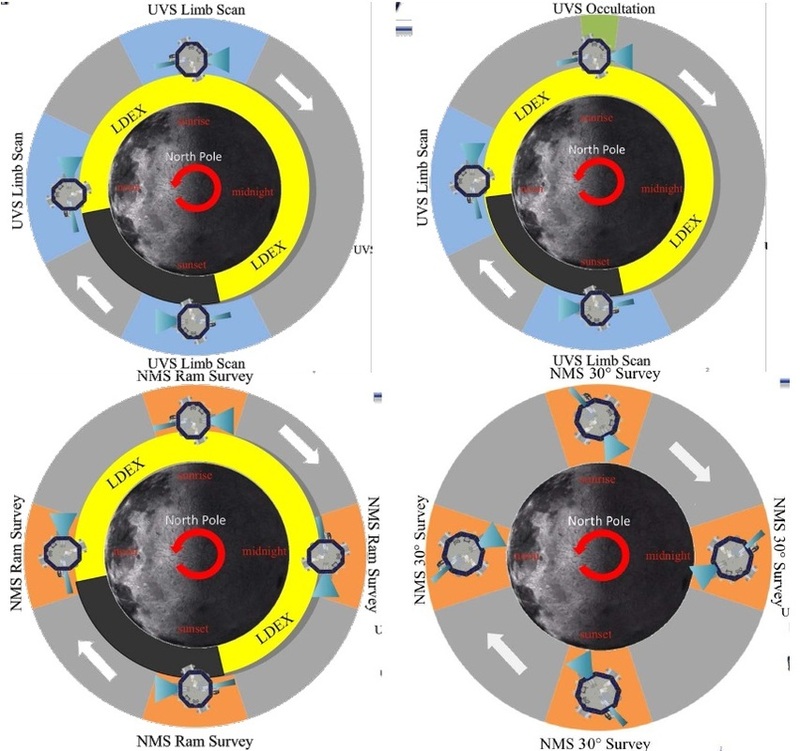 Also, the deployment of covers on the LDEX, UVS and NMS instruments is performed – all three are considered mission critical requiring live telemetry downlink. The next 25 days of commissioning are divided into 3-day intervals for High-Altitude Science Checkouts and 4-day periods of Lunar Laser Communications Demonstrations – totaling 9 days of instrument checkouts and 16 days of LLCD. LLCD operations are performed during Commissioning because of excess power when the science instruments are not required to operate because they are of almost no use at these altitudes. Due to power limitations, the LLCD is powered for about 13 to 15 minutes per orbit when a ground stations is in view so a total of five Lasercom Session are possible per day. LLCD accumulates about 16 hours of operations during the LADEE mission. During LLCD ops, LADEE has to point at Earth with an error of less than one degree to enable the fine-pointing to be accomplished by the payload itself. After 30 days of initial commissioning, LADEE is expected to be in a 200 by 300-Kilometer orbit due to the effects described above. At that point, the aposelene is lowered to 200km to circularize the orbit in order to set up the proper location of the periselene passage near the terminator. Shortly after the circularization maneuver, the periselene is reduced to target the terminator. The orbit is set up in a way so that the periselene drops to 50 Kilometers after ten days to enable the start of science operations. Over the course of these ten days, LADEE low-altitude instrument checkouts are performed around periselene which also provides initial science data. 40 days after the start of commissioning, LADEE conducts another engine burn to reduce the aposelene altitude from 260 Kilometers to 50 Kilometers to mark the beginning of science operations. In its operational orbit, LADEE is always four to ten days away from orbital decay requiring regular orbit maintenance maneuvers. 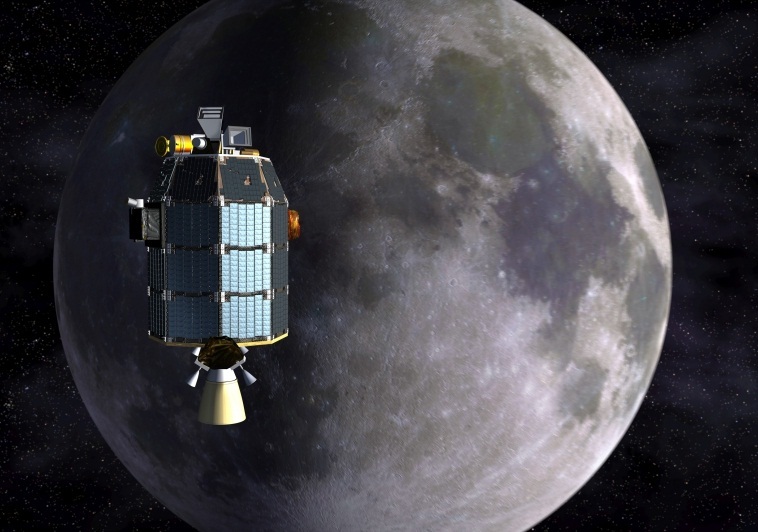 LADEE conducts a science mission of at least 100 days to cover three lunar cycles to gather data. Science operations are planned in a per-orbit fashion. With LADEE in an orbit with a period of 113 minutes, mission planners will be planning 12 orbits per day and a single day with an additional ‘leap orbit’ every few days. A variety of orbit types has been specified characterized by major vehicle operations or attitude activities. Orbits can include two types of NMS orbits during which the Neutral Mass Spectrometer is operated in continuous mode while the LADEE vehicle makes a 360-degree rotation per orbit to keep the instrument pointed at its target. The second NMS mode is rotisserie mode during which LADEE rotates at 1RPM. The first NMS mode is compatible with LDEX, Dust Detector Operations. Two additional orbit types operate the Ultraviolet-Visible Spectrometer. In its first mode, UVS is operated continuously, making limb observations in stare and nod modes. (See instrument page for details) In the second mode, the solar viewer is operated for occultation measurements. LDEX is compatible with both UVS orbit types. The remaining two orbit types are housekeeping orbits – one being a power orbit during which no instruments are active to allow LADEE to recharge its battery. The other type is a communications orbit during which the vehicle is pointed to Earth and downlinks science data via its Medium Gain Antenna. At least two Comm Orbits are performed per day. Command uplink can take place outside of the regular communication slots, but mission operations aim to perform the daily uplink during these sessions. Over the course of the science phase, LADEE mainly relies on the White Sands ground station for data downlink. In its equatorial orbit, LADEE sees Earth for half of its orbit and using only one ground station further restricts communication opportunities. To supplement White Sands, regular comm passes using Deep Space Network stations are planned. Because DSN supports a number of missions, it is only used periodically when data volume demands it. Critical mission events are also covered by DSN such as orbital maneuvers. Orbit maintenance maneuvers occur every three two five days, but can also be as infrequent as once every two weeks depending on lunar cycle and gravitational properties. This can not be predicted long-term and requires trajectory planners to adjust maneuver plans constantly and on short notice. What can be predicted are momentum dumps by the Reaction Wheels. These are scheduled to fit within planned activities and occur every few days. The LADEE mission is dependent on consumables, meaning propellants. 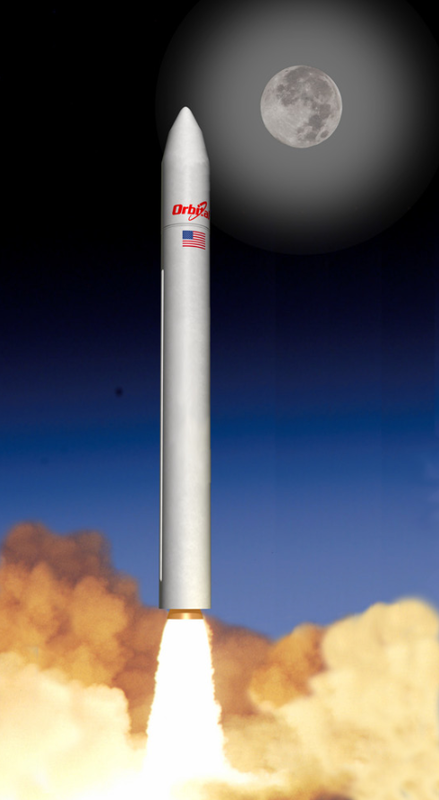 The planned usable delta-V budget after Lunar Orbit Insertion is about 190m/s. Depending on the amount of maneuvers needed during the science mission and possible contingency orbit maintenance operations, the required delta-v for the 100-day science mission could come in anywhere between 150 and 190m/s. Should propellant be remaining, the science mission would be extended. Toward the end of the mission, the orbital altitude of LADEE is lowered considerable with passes inside 20 Kilometers on periselene allowing high-value science data to be captured. In the final days of the mission, LADEE makes ultra-low altitude passes coming close to the surface when passing the lunar highlands. These ultra-low passes are a priority for exosphere data collection. LADEE finishes its mission with a targeted impact on the far side of the Moon – just like the GRAIL twins did in 2012. This is done to protect historic sites on the Earth-facing side of the Moon including the landing sites of the Apollo and Luna spacecraft. LADEE performs communications sessions with Earth until as late as possible to return the precious data from ultra-low passes. Copyright © 2019 LADEE. All rights reserved.